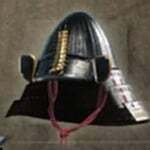 Rikishi Unit's Armor: Kabuto is a Head Armor in Nioh. "A simple helmet with a ridged appearance, and "shikoro" neck plates. The large centipede-like insect on the front is said to symbolise the act of always pushing forward in battle. Part of a traditional armor set known as Tosei-gusoku in Japanese, this armor was worn by a unit made of extremely large and powerful warrior. Assembled by a warlord looking to bolster his military strength, the fighters were equipped with odachi and used brute force to overwhelm their enemies."